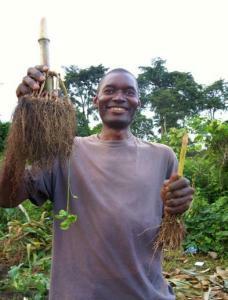 Since December 2008, more than 1500 subsistence farmers in Cameroon's South-West Region (SWR) have been participating in the largest-ever field trial testing the effects of biochar on crop productivity. The first results of this ongoing experiment, based on maize planted in a large series of plots, are now available. The data can be described as 'remarkable', in that they demonstrate how biochar consistently helps to boost crop productivity in tropical soils, sometimes in a spectacular manner. 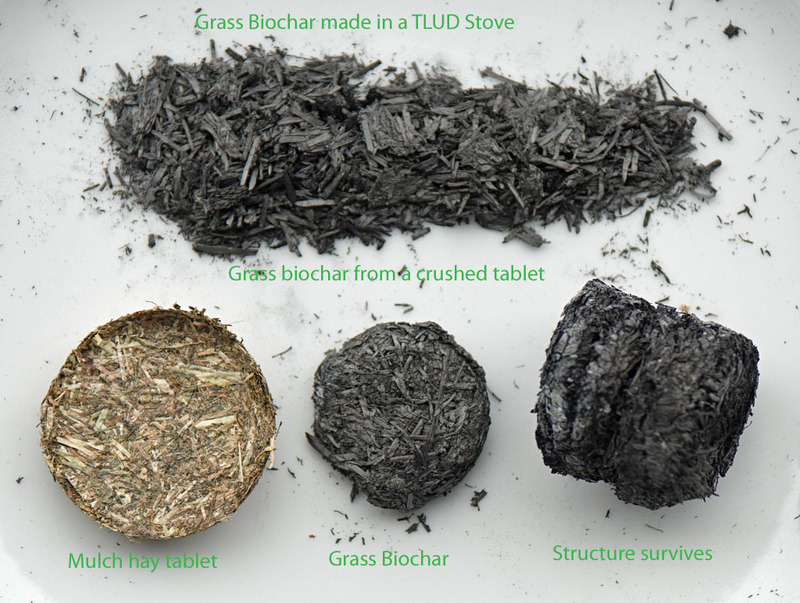 The preliminary results suggest that biochar may offer a solution to hunger and food insecurity amongst the world's poorest, as well as to soil depletion and tropical deforestation. Biochar Products is in the early stages of developing a biochar 10 Dry Ton Per Day biochar plant to be located on the old Ellingson Lumber mill site near Halfway, Oregon. CNN Burning Bio-char Story with Dr. Reddy. 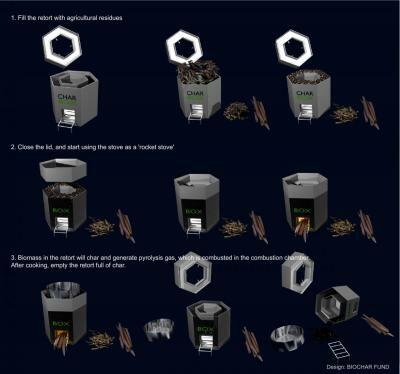 Attached as a Power Point file and a PDF is a nicely illustrated guide to creating a TLUD (top lit up-draft) biochar retort with two barrels. As he notes, understanding the TLUD is critical to getting reliable, clean take a look at our other TLUD References for more guidance. The amazing Frank Jeffers demonstrated the art of the distructive distillation of wood at the Northeast Biochar Symposium a few days ago. It featured water jacketed pipe for condensing pyrolysis products which flowed under baby oil in glass jars, gas storage under a floating barrel and ultimately running an internal combustion engine. Look what I just made! I used a 46 oz juice can , a 14 oz kernel corn can, a can opener, a strip of tin, and some tin snips. 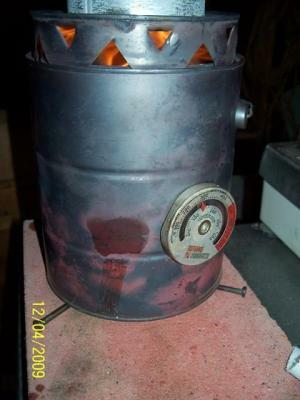 I will see if it can boil water now and makes charcoal out of wood chips. Then maybe I can send a you tube link. This is my first mock up of of the educational tool about biochar that I was thinking of developing and telling you about in Washington this past September. 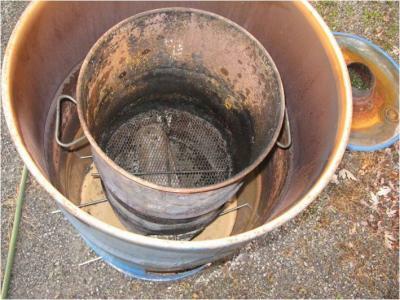 When it makes char, it should be smokeless, especially with dry feedstock, easy and cheap to build out of normal household stuff. and simple to use. With a little tiny bit of charcoal (maybe close to a cup?) 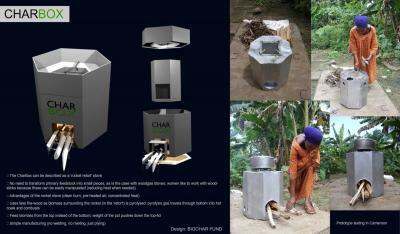 it could be put into two of four milk carton bottom test pots, then fertilizer in one with char and one without char. They kids could plant something grows fast and maybe edible (beans sprouts? ), then measure the performance of their own soil with a real experiment (1/4 control, 1/4 just fertilizer, 1/4 both charcoal and fertilizer, 1/4 just charcoal. (just like my garden). It could be an experiment started this winter after the holidays and ending late this spring before school let's out. 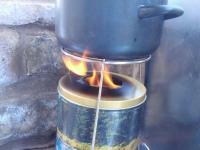 A Chris Adam Kiln retort which was built a year ago at the Kenyan Coast. 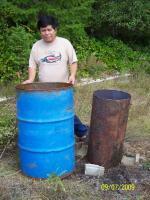 They are using it 3x a week to carbonize coconut shells and it seems to work well. Recent literature suggest that the split from a common ancestor between rice and the ancestor of maize happened some 45 to 60 million years ago. 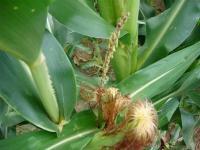 Maize was formed from teosinte as a common ancestor. Sorghum apparently split from the common ancestor with maize sometimes between 16.6 and 11.9 million years ago. If the environment is overcharging the abilities of the gene set, then the plant seems simply to split up in different lines of development (?? ), although keeping the, during evolution silenced gene sets, or inactivated subprograms. 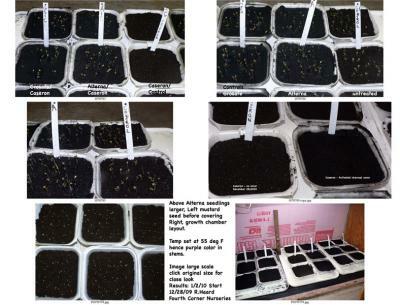 "Since 2005 Burt's Greenhouses have been heating their greenhouses with Biomass. What is Biomass? In our case it is wood. We burn waste wood (wood collected from construction, furniture manufactures, skids, etc. It this wood were not used in this way it would likely be land-filled. 0738 shows some firebricks arranged on top of the cover, it's weighted to help seal it. The fact that it's not screwed or clamped down allows for a simple pressure relief valve that won't get clogged with tar. 0740 shows the stove pipe chimney on top of the afterburner. The retort is surrounded with firebrick and heated from below, using a bit of firewood. It's an air tight process, rather than a restricted oxygen flow process. This allows close control of the pyrolysis temperature. After much expansion and refinement, the final copy (Version 2) of the "All Biochars..." paper has been released back to the NABC (North America Biochars Conference, Boulder Colorado, August 2009) for inclusion in their proceedings. Some Photos which prove that normal 450 degree Saligna char for barbequu use is quite bug friendly, housing demand for three different bugs is high and the bugs are still alive after digging through and forming there pupae. So high toxicity of the volatiles or the char it self seems to be an issue to overcome by some bugs. ( or its an other urban myth to be busted?) If a swiss cheese would look like this the would advertise him as an aerogel. Please add the photos to your collection in the bio char list.